More than 20 years after it ended, Armenia is still experiencing the burden of victory in the war over Nagorno Karabakh. 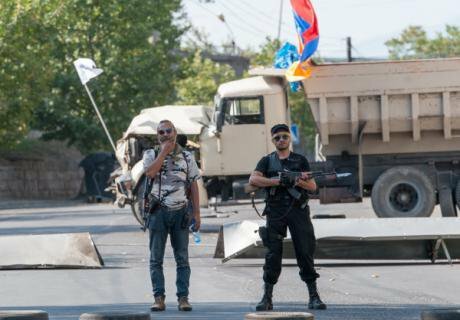 23 July 2016: members of Sasna Tsrer stand outside the police compound in Erebuni, Yerevan. (с) Asatur Esayants / RIA Novosti. All rights reserved.This month, Armenia tipped into violence, experiencing its worst political crisis in eight years. On 17 July, a radical armed group seized and held a police station on the edge of Yerevan for two weeks. The group took several hostages and killed two policemen before they eventually surrendered. To the surprise of many, thousands of Armenians were so disgruntled with the ruling regime that they supported the hostage-takers in a series of demonstrations, at least one of which was suppressed with brutality. The roots of this crisis lay in the failure by many governments in Armenia to fill a deficit of trust. They have not tackled key problems such as unemployment, corruption, emigration and a political culture of impunity. Of course, these problems are common to many countries — it was the form the confrontation took which was specifically Armenian. Indeed, the stand-off amounted to a clash between two sets of victorious veterans of the Karabakh conflict with Azerbaijan during the early 1990s. That intractable conflict and Armenia’s inability to find a path out of it remain a heavy legacy that blocks the country’s development. Several members of the armed group were ex-combatants of the Karabakh conflict. Their first demand was the release of Jirair Sefilian, a Lebanese-born commander who was arrested in June on suspected weapons charges. These veterans are the radicals. They are zealots: personally honest, burning with a commitment to social justice, while also advocating a fearsome nationalist agenda of “no compromise” vis-à-vis Azerbaijan and Turkey. In particular, they adamantly oppose the return of the occupied territories around Nagorno Karabakh, which were captured by the Armenian side as a buffer zone in the 1990s, to Azerbaijan. In defiance of the fact that these regions are internationally recognised de jure parts of Azerbaijan that were never part of the original dispute over Karabakh, the radicals refer to these captured territories as “liberated” lands. 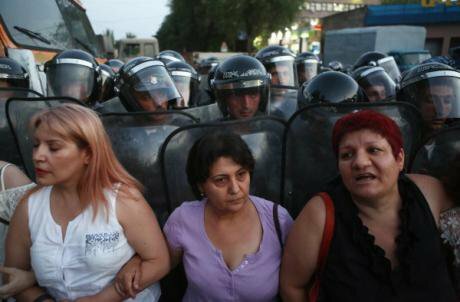 29 July 2016: residents of Yerevan gather against arbitrary police detention of protesters. (c) Asatur Esayants / RIA Novosti. All rights reserved.On the official side are what might be called the “institutional” Karabakh veterans who form the ruling administration of president Serzh Sargsyan. Many of them, including Sargsyan, are Armenians from Karabakh itself and they came to power on the wave of the victory in Karabakh. The experience of fighting that conflict has given these institutional actors a “securitised” outlook on the world and they are prepared to defend their power at all costs. Political violence runs through Armenian history like a blood-red line. The radicals’ group called itself Sasna Tsrer or “Daredevils of Sassoun” in reference to a medieval Armenian epic poem. They hark back to a tradition of Armenian nationalist militants who are known by the Arabic name fedayin. Many Armenians, in common with radical Irish and Palestinians and others who have suffered a history of persecution and displacement, are more inclined to venerate or at least tolerate armed men who take up arms against an oppressor, even as others label the same men “terrorists”. Dashnaktsutiun, Armenia’s most famous political party, evolved as a paramilitary revolutionary organisation, emulating the Bolsheviks and fighting both the Tsarist and Ottoman regimes. In 1896, for instance, an armed group of two dozen Dashnaks famously seized the Ottoman Bank in the centre of Istanbul and demanded international negotiations on the “Armenian question”. This exploit made them heroes to some and inspired songs that the Yerevan rebels of 2016 probably learnt at Dashnak summer-camps. But there was another lesson to the escapade: the seizure of the bank also triggered reprisals against Istanbul Armenians and polarised the community. 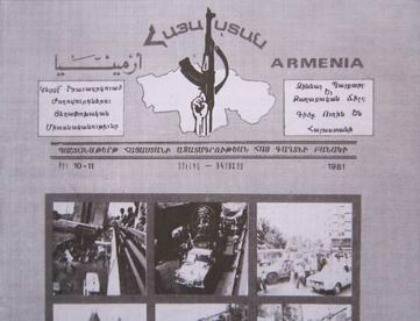 Hayastan journal of Armenian Secret Army for the Liberation of Armenia, 1981. Source: Wikipedia.Radical Armenians turned to political violence again in the 1970s, in an era when the “Armenian question” had disappeared from the world’s consciousness. Two separate groups of Beirut Armenians, ASALA and JCAG, started a campaign of terrorism against Turkish diplomats that left dozens dead over a decade. In the 1990s, some of those involved in that campaign, such as the American-born Monte Melkonian, joined nationalist militias formed and volunteered to fight in Karabakh against the Azerbaijanis. Sefilian, also from Beirut, but of a younger generation, made his name in that campaign. These militias were vital to the success of the Armenian side in the early stage of the conflict in 1990-1992 when Armenia was not yet independent, had no national army and, on the orders of Moscow, the already disintegrating Soviet armed forces gave more support to Azerbaijan than Armenia. Diaspora Armenian commanders, like Monte Melkonian or Sefilian, became folk heroes. Melkonian, who was killed in 1993, has an almost myth-like posthumous status in Armenia and Karabakh. In the summer of 1992, Sargsyan and Robert Kocharian, his old comrade from the Communist Party youth organisation, played a central role in trying to impose a “monopoly of violence” and coordinate all Armenian fighting forces in Karabakh. This more regularised military force gradually turned into the new army of Armenia and of Nagorno Karabakh (formally separate, but essentially one body). Karabakh-born Sargsyan twice served as minister of defence of Armenia. This group of Karabakhi and Armenian strongmen won the war for the Armenian side in 1994 against the Azerbaijanis. The Azerbaijanis were defeated in large part because they never properly built an army and were forced till the end to rely on a motley plethora of militias with their own political agendas. 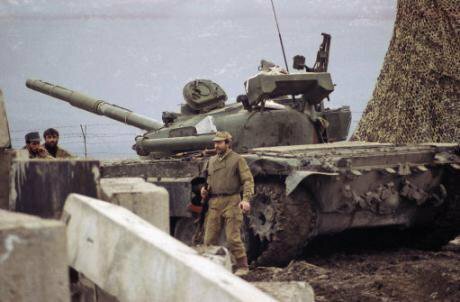 March 1992: An Armenian soldier stands next to a former Soviet tank in Stepanakert, the capital of Nagorno-Karabakh region. (c) Anatoly Maltsev / AP / Press Association Images. All rights reserved.In Armenia, by contrast, victory empowered the men in uniform. Once the war was won, veterans first took over Nagorno Karabakh and then Armenia itself. Many of them plundered the Azerbaijani-occupied territories around Karabakh, which had been captured almost undamaged in the conflict but whose towns, villages and factories were now dismantled and stripped bare. Later, in 1997-1998, the “no-compromise” faction of Karabakhis and veterans deposed president Levon Ter-Petrosyan in a palace coup for trying to forge a peace deal with Azerbaijan. They then took power themselves, with Robert Kocharian becoming president and Sargsyan - his constant second-in-command. This formidable group is still in power and can rely on well-equipped security forces to suppress any challenges to its rule. In March 2008, as Sargsyan was about to assume the presidency, security forces brutally dispersed people protesting against falsifications of the presidential election. Ten people were killed. On 29 July, 2016, Armenia’s police suppressed a demonstration in Yerevan with great brutality, which has been condemned by Human Rights Watch and others. Many peaceful protesters and journalists were injured by the police. To outsiders it will be a surprise that so many people in Yerevan came out in ostensible support of the “Daredevil” hostage-takers in Yerevan. For sure many of them were almost certainly taking an opportunity to protest against the status quo, rather than endorsing an act of violence. But even that is an indication of how desperate many mainstream Armenians feel in the face of a political system which they feel has no place for them — and which, due to recent constitutional changes, is likely to see Sargsyan and his team retain their grip on power for many years. The problem is that, even if Sargsyan is widely seen as having lost legitimate authority, no else in Armenia can obviously claim it. The unresolved Karabakh conflict looms large over the future of Armenia. Following the bloodshed of the “Four day war” in April when up to 200 people may have been killed in and around Karabakh, Armenia and Azerbaijan now find themselves on the brink of a much larger conflict. As Armenia’s internationally recognised government, Sargsyan and his team are the country’s face to the world and are compelled see the bigger picture on the Karabakh conflict. They see that if Armenia is at least not seen to be prepared to be flexible and countenance compromise on the issue of the return of the occupied territories to Azerbaijan, that it faces the danger of possible near-term war with an ever-more bellicose government in Baku. Even if war is avoided, the status quo promises Armenia only a future of long-term international marginalisation. 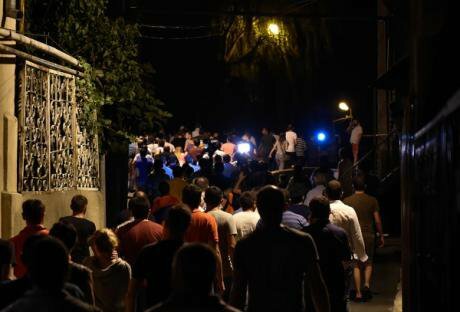 19 July: Yerevan residents gather in protest near the occupied police station building. (c) Grant Khachaturyan / RIA Novosti. All rights reserved.This is why Sargsyan continues to negotiate over the OSCE-sponsored peace deal, now being pushed hard by Russia, with the support of France and the United States, that looks very much like the one he deposed Ter-Petrosyan for backing — and why in the latest crisis Levon Ter-Petrosyan implicitly supported Sargsyan, calling on his fellow Armenians to focus on the external threat and on resolving the Karabakh conflict. The only path forward on the Karabakh issue lies through much more serious negotiations. On the Armenian side, this will entail a firm commitment to giving up the occupied territories in return for Azerbaijani concessions on the status of Nagorno Karabakh itself. But in the context of the fighting in April and the political crisis in July, it is much harder for a government in Yerevan to deliver on that deal. Sargsyan does not use the language of compromise in public and almost no moderate voices in Armenia speak up for peace or negotiations. Opposition politicians, keen to attack the authorities where they are weakest, denounce them for allegedly “selling out” Karabakh. Even Nikol Pashinyan, a moderate opposition leader who tried to play a conciliatory role in the hostage crisis and called for non-violence, plays the nationalist card when it comes to Karabakh. In the July crisis, Pashinyan condemned both Sargsyan and his former patron, Levon Ter-Petrosian, for being willing to make territorial concessions to Azerbaijan. The July crisis has hurt Armenia. It has given the impression to many that democratic politics is exhausted and that the use of force is permissible. It has underlined that the country has a deeply unpopular government, but no respected systemic opposition, It has thrown a new spanner in what was already a dysfunctional peace process with Azerbaijan at a time when new conflict is a real possibility. It is unlikely that Armenia can find a way out of this impasse on its own. Its major ally, Russia, offers only coercive pressure. Armenia needs help from international friends and the more pragmatic parts of the diaspora to help it navigate a way forward at a time of domestic discord and great international uncertainty. How did we get to here? Check out Armine Iskhanian on how the marginalisation of activism can help fuel the search for more extreme methods.